Just because oatmeal is one of the world’s healthiest meals in the world, doesn’t mean that it also has to be one of the world’s most boring meals. Give this tasty oatmeal recipe a try from The FastDiet Cookbook by Mimi Spencer and Dr. Sarah Schenker. Add a delicate swirl of pomegranate molasses, along with pomegranate seeds and a dusting of cinnamon, to arrive at a wonderful, ruby-studded dish with a flash of inspiration from the Middle east. Use old-fashioned oatmeal as it will keep you fuller longer than the more processed varieties. 5-minute cooking time). Leave to stand for a minute before adding the molasses and fruit. Photo Copyright © 2013 by Romas Foord from THE FASTDIET COOKBOOK, published by Atria Books, a division of Simon & Schuster, Inc. Enjoy delicious low-calorie meals that can help you lose weight, become heart-healthy, and lower your risk of major diseases. 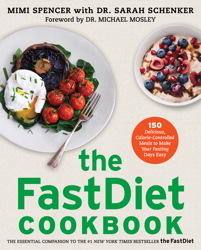 the FastDiet became an instant international bestseller with a powerful life-changing message: it’s possible to lose weight and reduce your risk of diabetes, cardiovascular disease, and cancer, all while eating what you would normally eat five days a week. You simply cut your caloric intake two days a week to 500 calories for women, 600 for men. Now, the FastDiet Cookbook offers 150 nutritious, low-calorie recipes, ranging from simple breakfasts to leisurely suppers, enabling you to incorporate the FastDiet into your daily life. With this indispensable companion book, you will never have to worry about planning your fast days again! Mimi Spencer is a journalist and author. A feature writer and columnist for newspapers and magazines, she is the co-author of The FastDiet and the author of 101 Things to Do Before You Diet.